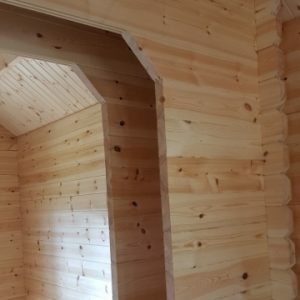 At Astwood we make all our log cabins to order here in the UK which means we can help you design something a little bit different. We have worked with a number of schools on projects ranging from a 5m x 10m outdoor classroom to a 3.1 x 4m open sided hut for observing nature. 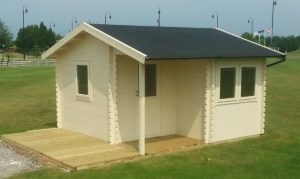 Our log cabins are popular with golf clubs as a cost effective way to provide a halfway house. We can also provide smoking shelters for offices, pubs and hotels. Man Cave style log cabins with a hipped roof and porch . 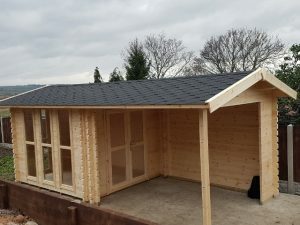 Most standard shaped log cabins can be made in non-standard sizes, for example, if you can’t fit a 5m x 4m log cabin in your garden but 4.2m x 3.7m would be fine, then it shouldn’t be a problem to make that for you. Astwood does not recommend very small log cabins e.g. below 2.4m x 2.4m. The Man Cave is a very special log cabin with a hipped roof and small porch to the front. It is certainly an eye-catcher and bound to impress. The Man Cave is not just for men, though that was the name that stuck, it is the perfect She-Shed or family room too. 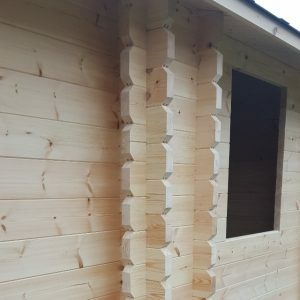 Our skilled craftsmen work hard to manufacture and build this log cabin, which requires a lot of precision cutting on site, for this reason we have kept variations to a minimum. The Man Cave is available as standard in 5m wide x 3.1m deep plus porch. 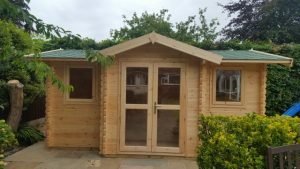 Other sizes may be possible as bespoke log cabins on request. To make large log cabins we have to join two logs. We do this using a unique column structure. The two logs are butted up to each other and then encased in a column of wall logs which is held secure with interlock corners. It means the join is not open to the elements and instead of being a weak spot, it is actually a very strong structure. The column show externally under the eaves. 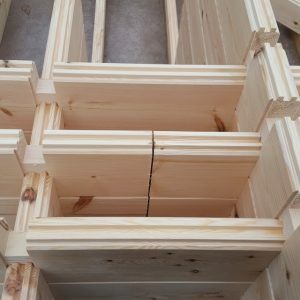 Internally, to further strengthen the log cabin, we add two overhead gables at the join point to support the roof, and smaller logs running up the sides of the log cabin to support the gables. Large log cabins can be any length. The maximum gable width is 5m. Some examples of the bespoke log cabins we have made in the past can be seen in the gallery. 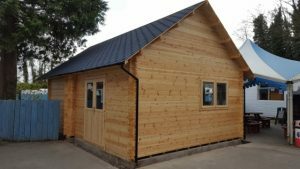 If you would like to speak to us about designing a bespoke log cabin please use the online contact form or call 01270 756698.